October 11, 2013 - On Thursday retired Judge Richard Levie who was appointed by U.S. District Judge Colleen Kollar-Kotelly to act as an adjunct, Special Master (mediator) in the U.S. Department of Justice (DOJ) lawsuit over the US Airways-American Airlines merger has made two recommendations to the court that if adopted would bar the carriers access to certain DOJ documents. 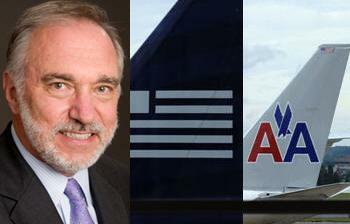 This could be a huge setback in the American and US Airways merger. US Airways and American Airlines, which are two large “legacy” airlines, announced plans in early 2013 to merge and if the merger went through it would make the two carriers the world's largest airline. The chief complaints in the suit brought by the government are that if the two carriers were allowed to merge it would eliminate competition and increase airfares. US Airways and American Airlines and DOJ exchanged requests for production of documents and interrogatories in late August and engaged in numerous “meet and confer” sessions addressing the discovery sought. The U.S. Department of Justice and US Airways and American Airlines each turned over thousands of documents. On September 20, US Airways and American Airlines as part of the pre-trial discovery process filed a motion to Compel DOJ to 1) turnover the names of third parties that DOJ interviewed before filing the lawsuit, and 2) turnover the documents from DOJ’s review of four previous airline mergers between 2005 and 2011 in which the Justice department did not challenge those mergers (the 2005 merger between US Airways and America West, 2008 merger between Delta and Northwest Airlines, 2010 merger between United and Continental, and the 2011 merger between Southwest Airlines and AirTran). Update – October 14, 2013 - American Airlines and US Airways reported today that neither carrier will appeal Special Master, Richard Levie’s recommendations to the court. American Airlines and US Airways said they were confident they can beat the government's lawsuit even without the information.